The decision between these two life possibilities (Christianity and Marxism) is neither economic nor political; it is religious —Tillich Paul Tillich never abandoned the Marxist ideas he developed during the political upheaval of his native Germany in the 1920s and 1930s. Indeed, he subsumed and incorporated Marxism into the construciton of his post-German religious thinking and theology which he pioneered after fleeing to the USA in 1933. 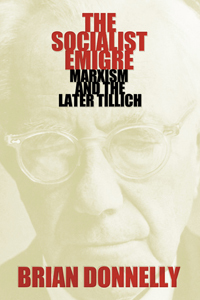 In the Socialist Emigre, Brian Donnelly deals with the philosophical foundations of Tillich’s theology, specifically the important thread of Marxism, and argues that Tillich’s later and highly acclaimed theology cannot be divorced from his earlier Marxist views. This makes for a seminal work which examines Tillich in a new and critical light and furthers the debate as to the structure of his philosophical theology and the nature of his eclectic thought. This unique study features Tillich’s boundary thought regarding Marxism and religion, faith and culture, history and supernaturalism, and emphasizes Tillich the philosopher rather then Tillich the theologian.